Today it takes up to 10 calories of oil to produce one calorie of food. Joel Salatin from the US, heralded as the worlds most successful farmer, was in Sydney recently where he gave an illuminating talk. By uncovering the inefficiencies of our chemical food system he offers us a better way to treat the land and ourselves. Inspired, I consider how these ideas can be applied on the household level in part 3. Today most farms run on linear systems of a single species. This causes the economics to maximise the yields of a single crop or animal. An "amazing pathology" establishes due to overstocking of one species, opening the doors wide for an increase of species specific pathogens. On the other hand, mixed-speciated farms, where inspiration is taken from nature, allowing a mix of species to co-exist, causes "confused pathogens". There is so much going on that the pathogens have trouble finding their preferred host. On Polyface Farms, cows are cell grazed by keeping them in small paddocks and moving them to a new area of grass each day. Nature's "biological sanitisers", chickens, follow, scratching over the cow manure and adding their own manure. Machinery versus the pig. Salatin doesn't use a petroleum driven tractor to turn his compost. He adds corn cobs to the piles to ferment. Then he lets in his willing work force, pigs. "We'll work for corn". They turn the compost over whilst going on a treasure hunt for the buried corn, "pig aeration". Salatin asks "What about retirement? We eat them!". "The animals do the work and suddenly it completely revolutionises the way the work gets done on the farm." Join your local permaculture group, where you can learn how to use this successful mixed approach to food production in your backyard. 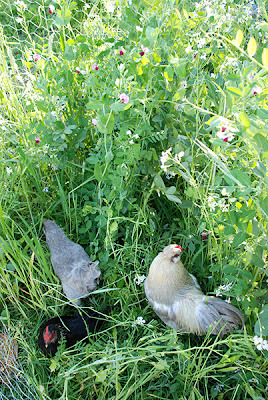 Employ poultry in your backyard to scratch over spent vegetable beds, and control weeds and pests. To learn more read Mandala Chook Clock Garden. Ask your local farmers how they produce your food, ask them if they practice a mixed system of production.